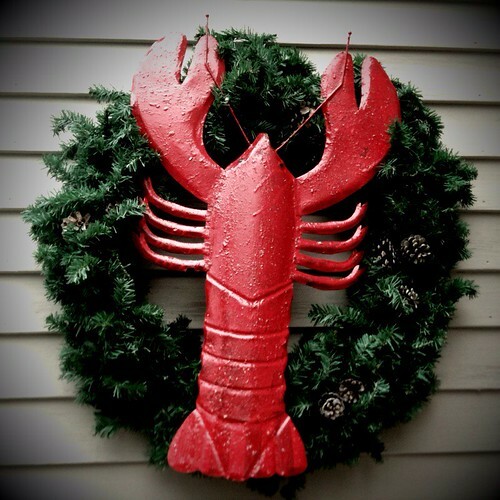 Happy Holidays from Shiny Maine Lobster! While we’ve continued to build out Thankfulfor and work on some other ideas, a new opportunity presented itself and we jumped on it. As you may know, Jen (@noreaster) is from Maine, where her family has a lobster business. And if you’ve seen any news at all around the plight of the Maine Lobstermen, you may also know that they are having a tough time. Despite continued popularity of the shellfish, the wholesale prices have hit rock-bottom in recent years. That along with higher fuel and bait costs and the state’s tight self-regulation (for conservation purposes) policies, many lostermen are getting squeezed to the point of no return. So, after years of trying to get Jen’s family business online, Captain Dave (her dad) finally acquiesced. Today we’re happy to announce our partnership with Captain Dave & Lobstahlady Frannie with the new site Shiny Maine Lobster. Now, there are many other sites where people can order lobster online. But Shiny Maine Lobster is not just about ordering a nice dinner. It’s about getting to know who is doing the work, how they do it, and knowing where your money is going. When you go to the grocery store, or eat out at a restaurant, it’s very rare you’ll know exactly where your food came from and the many stops it made along the way. Shiny Maine Lobster is a place to not only get to know the family behind the business, but to invest in their sustainable business and pretty soon, contribute back as part of a community who loves this New England tradition. We’re excited about growing this business to include more local lobsterman and artists. Interested in participating or have ideas for us? We’d love to hear from you. To ensure a supply for her lobster-roll chain and a supermarket line of lobster products, Ms. Bean has spent millions to acquire and upgrade three wharves and buying stations — where several dozen lobstermen sell their catch — as well as a processing plant on the state’s midcoast. Her goal, she said, is to save Maine’s most iconic industry by ending its dependence on Canadian processors and, under her Linda Bean’s Perfect Maine label, to mass market Maine lobster the way Perdue does chicken. She has worked to win their loyalty by selling bait and gas with no profit margin, she said — lobstermen are independent operators who own their boats — and by giving them annual bonuses that amount to an extra 33 cents for every pound they sold her that year. “They’ve become quite loyal,” she said. Will lobster roll “fixins” (knuckle/claw meat) be part of the Spitfire/Shiny Maine offering? Thanks for the note swisshegemonist! We sell whole lobsters vs cooked meat, so for those who don’t mind jumping in with the the knuckle crackers, they can pull and pick their own lobster roll “fixins”. As for Linda Bean, I think I’ll ask Capt’n Dave about it He’s known to have lots of opinions.